William Morrow Paperbacks, 9780062204714, 560pp. Inspired by New York Times bestselling author Neal Stephenson, an anthology of stories, set in the near future, from some of today’s leading writers, thinkers, and visionaries that reignites the iconic and optimistic visions of the golden age of science fiction. In 2012, Arizona State University established the Center for Science and the Imagination to bring together writers, artists, and creative thinkers with scientists, engineers, and technologists to cultivate and expand on “moon shot ideas” that inspire the imagination and catalyze real-world innovations. Now comes this remarkable anthology uniting twenty of today’s leading thinkers, writers, and visionaries—among them Cory Doctorow, Gregory Benford, Elizabeth Bear, Bruce Sterling, and Neal Stephenson—to contribute works of “techno-optimism” that challenge us to dream and do Big Stuff. 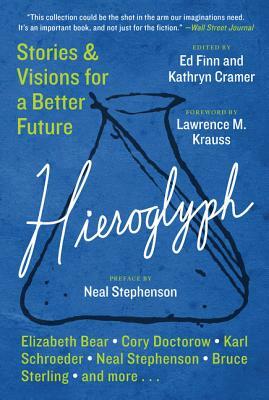 Engaging, mind-bending, provocative, and imaginative, Hieroglyph offers a forward-thinking approach to the intersection of art and technology that has the power to change our world. Ed Finn is the founding director of the Center for Science and the Imagination at Arizona State University, where he is an assistant professor with a joint appointment in the School of Arts, Media and Engineering and the Department of English. He has worked as a journalist at Time, Slate, and Popular Science. Kathryn Cramer is a writer, critic, and anthologist, and was co-editor of the Year's Best Fantasy and Year's Best SF series. She has co-edited approximately 30 anthologies. She was a founding editor of The New York Review of Science Fiction, and has a large number of Hugo nominations in the Semiprozine category to show for it. She won a World Fantasy Award for her anthology The Architecture of Fear. Kathryn grew up in Seattle. She holds a B.A. in Mathematics and a masters degree in American Studies, both from from Columbia University in New York. Recently, she has been a consultant for Wolfram Research, L. W. Currey, an antiquarian bookseller, and for ASU's Center for Science and the Imagination. She currently lives in Westport, New York in the Adirondack Park.